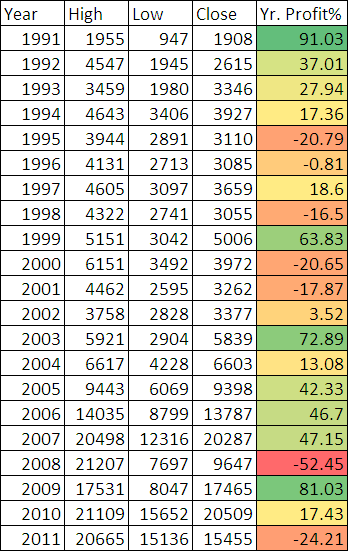 We have already seen the historical returns of the BSE Sensex, which indicated an average return of about 20% per year, despite many yearly returns varying from -20% to +60%. 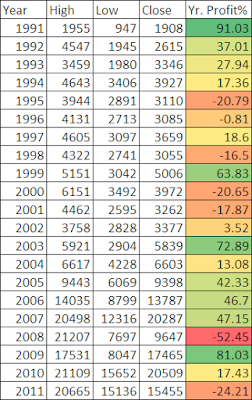 The following table shows BSE Sensex historical data - yearly high,low,close and also the yearly returns of the sensex from 1991 to 2011. There are some interesting points to note from the above data. Post 2008 crash of about 50%, one can see how the markets have performed differently in each year. In 2009, the markets gave positive returns of about 81%, in 2010 the returns were just 17% and in 2011 the returns were down 24%. The interesting point to here is the average returns are about 20%, even after the 2008 crash and 2009 boom. The lesson is pretty much clear - long term investing pays and one need not bother too much about the ups and downs of the markets. During the past few years, the returns from investing in individual stocks are varied, only few were multi-baggers, while most of them have come down anywhere between 80-90%. The message for retail investors is clear that - index investing is better than individual stocks. Individual or Retail investors are better of investing in index Exchange Traded Funds (ETFs) like Nifty Bees or Top mutual funds, which have given consistent returns over longer term. Calculating 2011 close of 19455 and current sensex of 19000, the sensex has given a positive returns of about 23% this year, till date. Nice. keep us updated ! Hi. Would it be possible for you to construct data for BSE Sensex for 1980-90? Help would b apreciated, thank you.